Diamonds are chosen and worn for their value and beauty, and while the best pieces of diamond-fitted jewelry are designed to last forever, that doesn’t mean they don’t require a little cleaning and maintenance every once in a while. 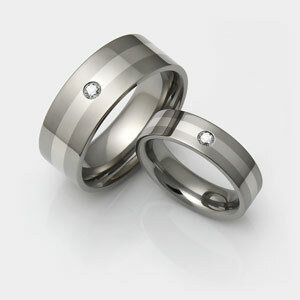 Fortunately, the titanium in diamond titanium rings is very low maintenance. Because of the strength of the material, it’s also resistant to tarnishing, corrosion, and deformities. Diamonds are another story. With traditional pronged settings, it’s necessary to inspect the setting of your diamond regularly to make sure that it’s not loose and at risk of becoming dislodged. Prongs can snag on clothing, other jewelry, and loose objects. Tension rings, on the other hand, are calibrated to the exact size and shape of the diamonds that they hold, so there’s no danger of losing the diamond because of a damaged prong. Tension rings exert anywhere from 12,000 to 50,000 psi and will not lose their spring-loading compression strength over time. For either type of ring, a manufacturer defect will increase the chances of a dislodged diamond. This is why it’s especially important to keep an eye on the ring for the first few years. It’s also a good idea to find a supplier that has a good return policy with an extended return period, and offers a lifetime warranty. Diamonds tend to attract grease, from exposure to natural skin oils, skin products, detergents, and other substances found in the household. In particular, hairspray and furniture polish are notoriously damaging. These can affect the brilliance of your diamond over time. Cleaning titanium rings with diamonds is simple. Soak them in a bowl of water with mild soap such as baby soap or dish soap. Brush gently with a soft brush, then rinse and dry with a microfiber cloth. Note that cleaning procedures for titanium rings with other gemstones such as opals or coral will be different. In general, these should be wiped rather than soaped and scrubbed. Jewelers advise picking up engagement rings by their band, and never by the stone or setting. As mentioned, the diamond may suffer damage or discoloration from oils and other substances, and are more susceptible than the metal. This is especially true with diamond titanium rings. Although diamonds and titanium are known for their durability, they can still get damaged and scratched, particularly by other diamonds and titanium jewelry, or when working with tools. Store diamond titanium rings in their original box, or a small cloth pouch to keep them from rubbing against other pieces of jewelry. Keep the box or pouch in a safe, dry place. Titanium is not sensitive to most chemicals, but it should still be polished to maintain its original sheen. Check with the manufacturer to determine what kind of finish your ring was given in order to learn the proper polishing technique and implements that you will need. If polishing the ring yourself can no longer give it its original shine, you can also have it professionally buffed or polished.